Editors note: As we continue to expand our list of contributers to Catavino, we would proudly like to introduce Janelle Norman. Janelle hosts a wine blog covering all those little culinary gems in Madrid you wouldn’t find unless you were in the “know”. Upon request, she is also available as an informal guide of the city. She’ll be writing a weekly column for us on Madrid’s food, wine and culture. Enjoy! For those who are planning a visit to Spain’s bustling capital, who are just curious about Spanish wine and food, or just in love with the city, I will be writing a weekly food and wine article direct from Madrid. I’ll share the hidden and authentic Spanish Tapas bars that only the locals know of, local restaurants filled with traditional fare, and age old Spanish recipes so that you can bring a little Spanish flare to your kitchen. Who am I? 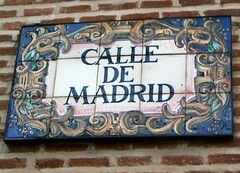 I am an American who has lived in Madrid, near Retiro Park, since 2000. After seven years, I have fallen in love with this city. I absolutely love to cook Spanish food. I thoroughly enjoy Spanish wine. And I am especially interested in the history and the traditional foods of Spain. I give Tapas and Spanish wine tasting tours throughout the historic city of Madrid, exploring the hidden corners and lively Tabernas, while savoring the unique Spanish flavors. Read more on my website, www.tapastalk.com. To thank Ryan for asking me to be a part of Catavino, I have included a previous article from Tapastalk.com about a wonderful sherry bar in Madrid. Having introduced Ryan to what has become one of his favorite sherry bars, I figured it would be the ideal article to kick off my weekly series. For the best Sherry in the world, simply travel down to Spain’s southern coast around the town of Jerez. But here in Madrid, you can get a taste before you go. Don’t like sherry? Maybe you do but just don’t know if yet. Unlike wine, sherry does not benefit from being in the bottle, so the closer you are to it’s source, the better. Here in Madrid, we are relatively close, same country, but step inside the Madrid bar “La Venencia” and you are immediately transported to Andalusia circa 1950 or before. Since the 1920’s, La Venencia’s unassuming exterior has welcomed visitors on the street Echagaray near Madrid’s center, Puerta del Sol. The wooden bar has fresh chalk marks displaying the client’s tabs. Dusty bottles line the back wall of the bar with decorative sherry barrels and a “venencia”. A venencia, the bar’s namesake, is a small cup attached to the end of a long rod used for extracting sherry to taste from barrels in the solera system. The yellowing walls hold antique posters announcing the Jerez spring fairs from years such as 1949 and 1957, while a friendly cat sleeps on one of the tables at the back. 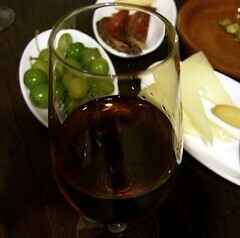 Order your sherry at the bar along with tapas before taking a table. Olives (REALLY good ones) or almonds come free with the drinks but you can try ham, cecina (cured beef), mojama (cured tuna), manchego cheese etc, for about 2 euros per tapa. La Venencia serves a variety of types of Sherry or “Jerez” as its called in Spanish. You could try: Fino, Oloroso, Amontillado, Palo Cortado, Pedro Ximénez and Manzanilla. For a description of these sherries, Catavino has an extensive explanation of all styles and of the way its made called Sherry 101. One of my favorites is Palo Cortado, so if you aren’t sure what to order you can see if you agree with me. And in keeping with good Andaluz tradition, you pay at the end. The bartender adds up your tab in chalk right on the wooden bar and probably won’t accept a tip. Before you step back out into the busy Madrid nightlife you sigh, aahhh, this is Spain.